Once when Switzerland was a poor country-I cant think it ever happened seeing what it is now- young men went abroad looking for jobs in security since they were known for the discipline and loyalty as mercenaries, based on which eventually Swiss Guard Regiment was formed. I knew that Swiss Guards is corps of soldiers responsible for the safety of Pope but did not have more info other than that they dress in unusual coloured tunics of red,blue and yellow, a bit of comic looking attire for me . One can see them standing motionless with tough expressionless faces in front of important places in Vatican including St Peter's Basilica. But I never knew that they are well known for their bravery and sacrifice,supposed to be one of the best in the world for the last few centuries.Not only for Pope but earlier Swiss Guards have been serving as trustworthy guards for few Governments in Europe notably the French royal family.During the course of the history of Swiss Guards since inception in the 15th century, the most famous episode was their defense of the French palace in Paris during the French revolution. On August 10 of 1792 around 700 of Swiss guards were massacred by the angry mob while defending the royal palace. 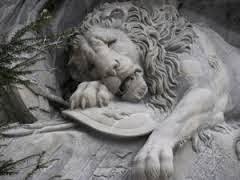 This outstanding monument in natural rock was created to pay homage to those 700 Swiss Guards.The heroic stand of the Swiss is commemorated by a lion monument above which is written in Latin-" to the loyalty and bravery of the Swiss". It was inspired by the art of Danish artist Bertel Thorvadsen and sculptured by Lukas Ahorn in 1820. The monument is sculptured right in the face of the cliff which overlooks a pool . I could see the sad face of a dying lion very well set in natural rock. The expressions of the painful face of the lion with a spear stuck in its body are well carved out in the rock as if in a painting on a canvas, which is seen best few meters away by a visitor because of the pool. Mark Twain,the famous American writer after visiting the site wrote that "it is the saddest and moving piece of rock in the world". I am not an artist to agree or disagree but it is true that I have not seen such expressive animal face carved out on rock. If one looks closely the photo which myself clicked above, the outline of the sculpture resembles the shape of a pig. It seems the sculptor had a fall out with those associated with the monument over settlement of money or something else and that's why he created the pig shape out of spite!! I have been trotting around the world widely for the last 20 years. Hardly I could meet fellow Indians- either on business or holidays- in Europe except London till recently. I vividly remember my visit to ACHEMA 1995 at Frankfurt, which is an international technical fair where all industrialists, business executives, engineers, entrepreneurs related to chemical industries world wide visit, supposed to be the best of its kind in the world.I made myself use of three full days there to see what best I can fetch for my company in the large multi storied 'messe'. But that was the first time I was convinced myself that Indians attend those international fairs rarely those days since only handful of Indians were seen. Only others from all over the world came to India from time immemorial but hardly few Indians went out to other countries until recently especially on business . Time has changed now. Opening up of Indian economy has opened up many avenues for Indians to travel abroad.Not only businessmen and executives but also techies, professionals and even blue collared technicians have started travelling widely for the last decade or so. Now Indian tourists also are invading world capitals and tourist spots.Tour operators have mushroomed in India and consequently upper middle class of Indian population are going abroad on holidays mostly as groups. It is not a rare scene anymore that a sari clad vegetarian lady is seen on the top of Alps or elsewhere. A good change indeed!! Chinese, Indian, Korean tourists- in that order- are flooding the international tourist spots, may be for the last two years, which is well identified by the local authorities. Name boards in Hindi or availability of Pav Bhaji or masala tea in Mount Titlis of Alps was a surprise for me . The most surprising was an Indian flag hoisted above a popular store in the commercial center of Lucerne in Switzerland!!! I am sure that the present state is only tip of an iceberg of Indian tourists to flood rest of the world in coming years.